One Friday afternoon with the house freshly cleaned and the children watching a movie, I decided to tackle their bathroom floor. 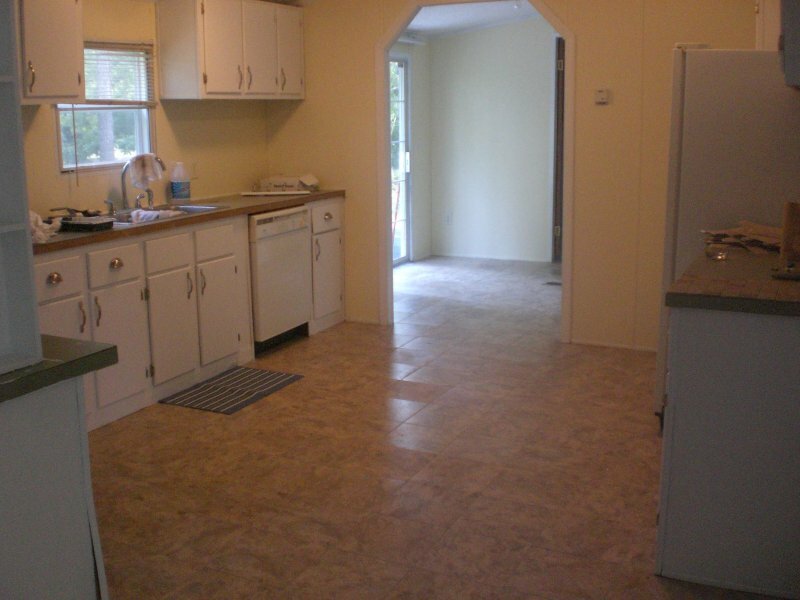 It had the same white linoleum that was in the kitchen, and with lots of muddy feet and little bodies, this floor was never clean for long! 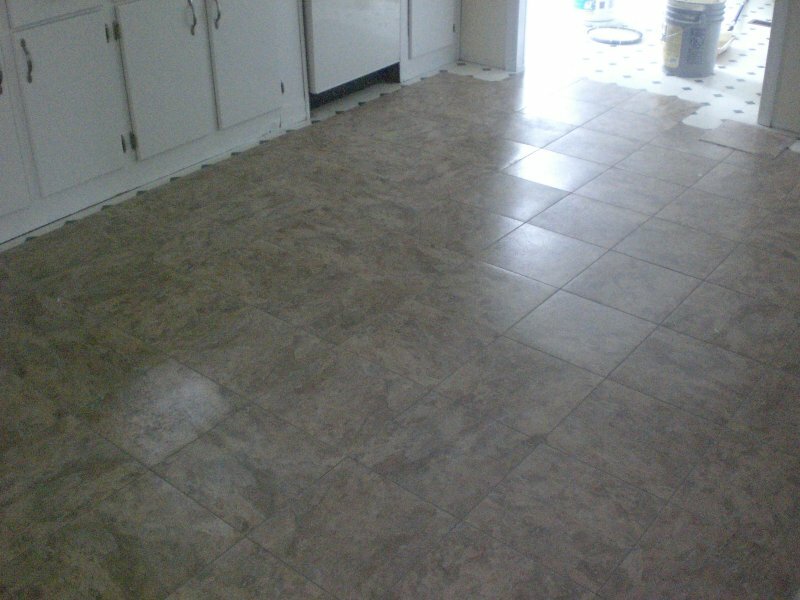 I had plenty of tile left over from the kitchen floor re-do, since I never ended up tiling into the large utility closet. 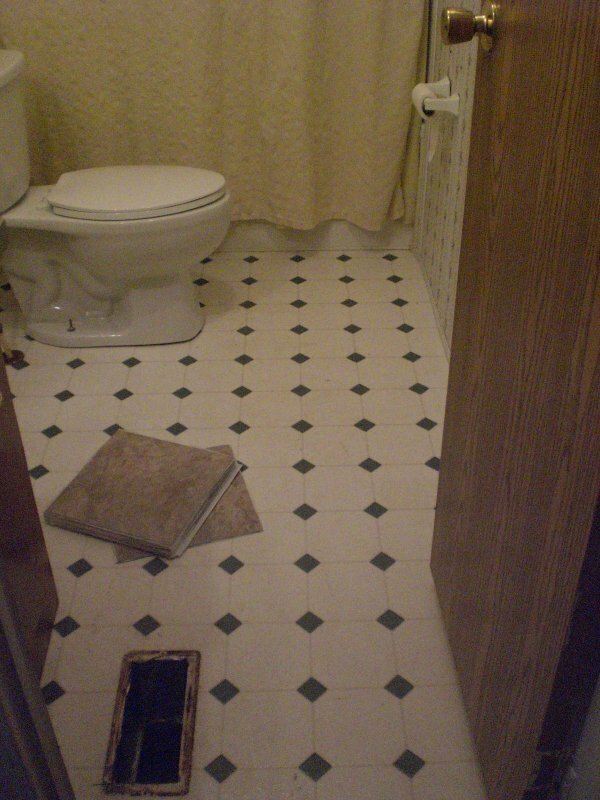 I’m glad now that I didn’t, since reflooring the bathroom was a much better investment of the tile and the time! At left you see the bathroom before. 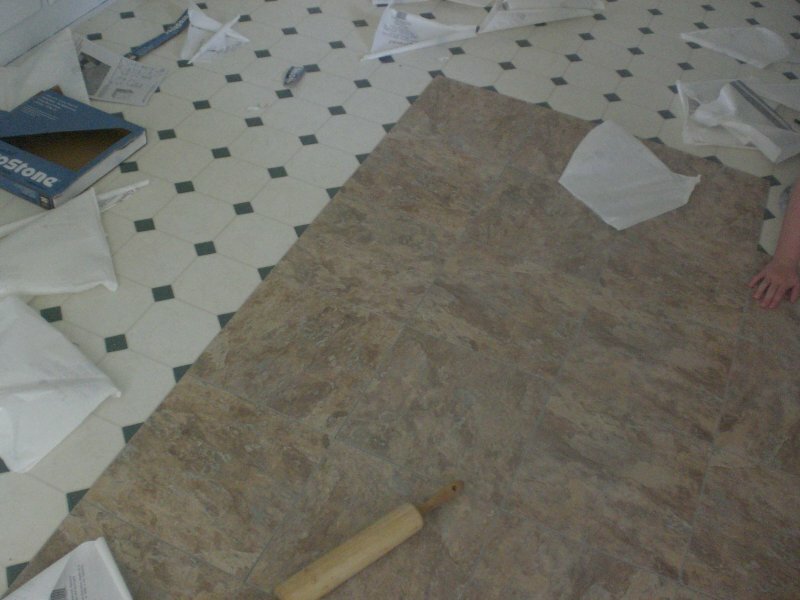 I’ve removed the floor vent cover, and the linoleum has been mopped and stripped to remove any waxing remnants. 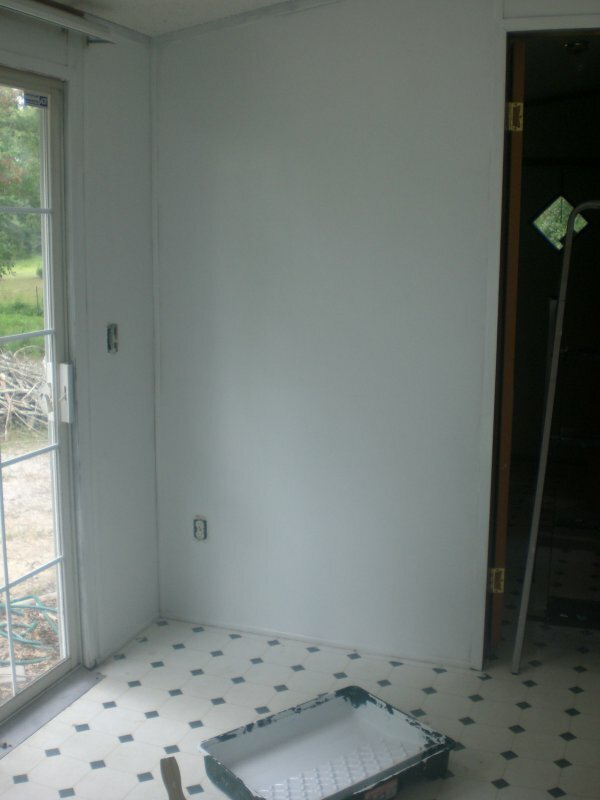 You can see the vinyl sticky tiles waiting for me. 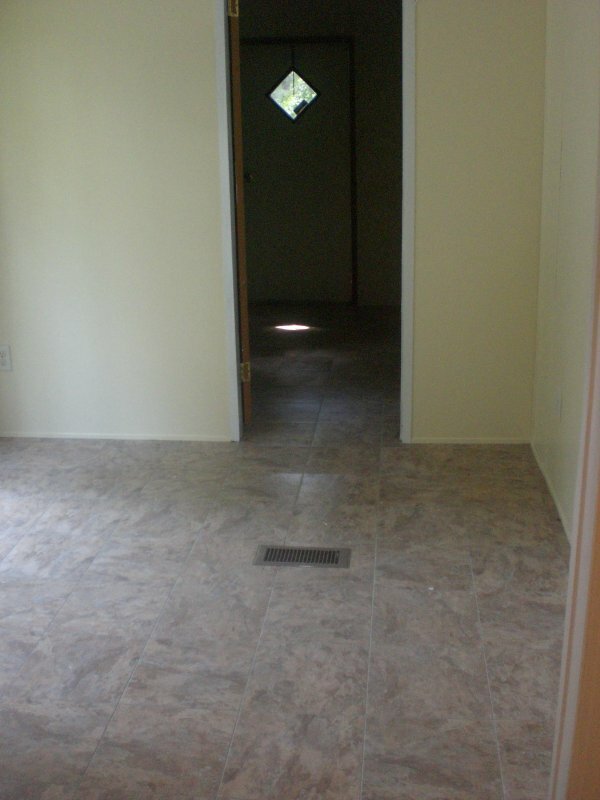 I debated on where to start tiling in this room, since it is so small. It seemed silly to mark the exact center and begin from there, so I chose instead to start behind the door (the lower right-hand corner in the photo above). 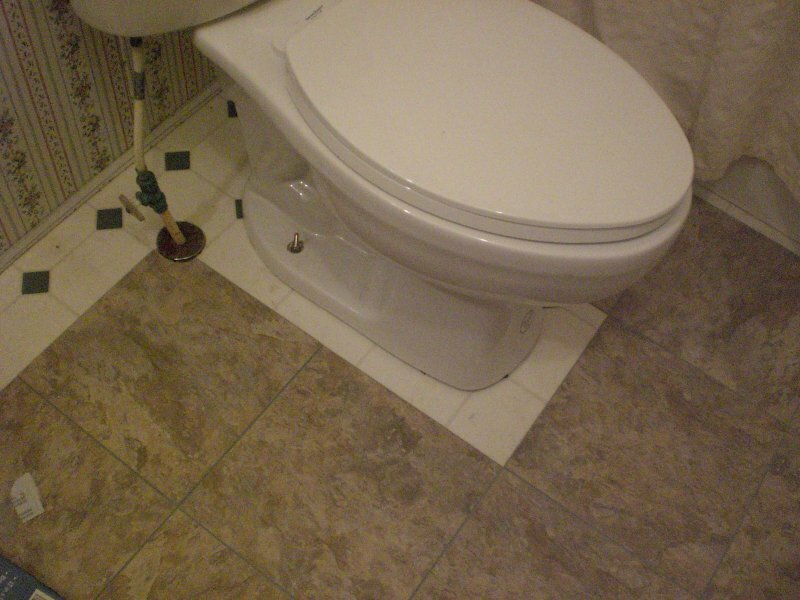 This proved to be a very good choice, as I ended up not having to cut so many tiles to get around the air vent hole. 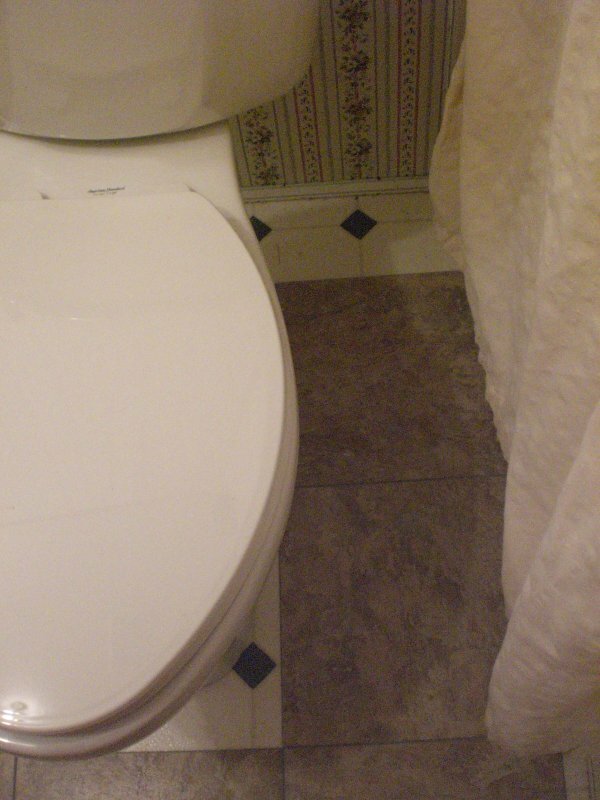 With these tiles in place, I quickly moved on, since I could just place all the tiles along the left-hand wall and match another row next to them before I had to cut around either the vent hole or the toilet. 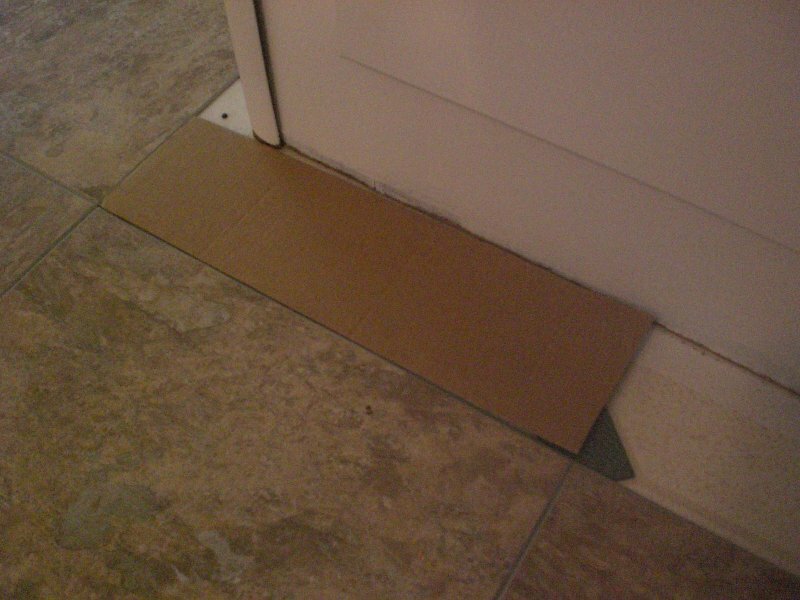 Cutting around the vent hole wasn’t very hard, since I only had to cut two tiles, and both of those tiles went up against the bath cabinet. The only tricky tile was the one that had to go around the door jamb (which you can see in the upper right-hand corner of the photo above). 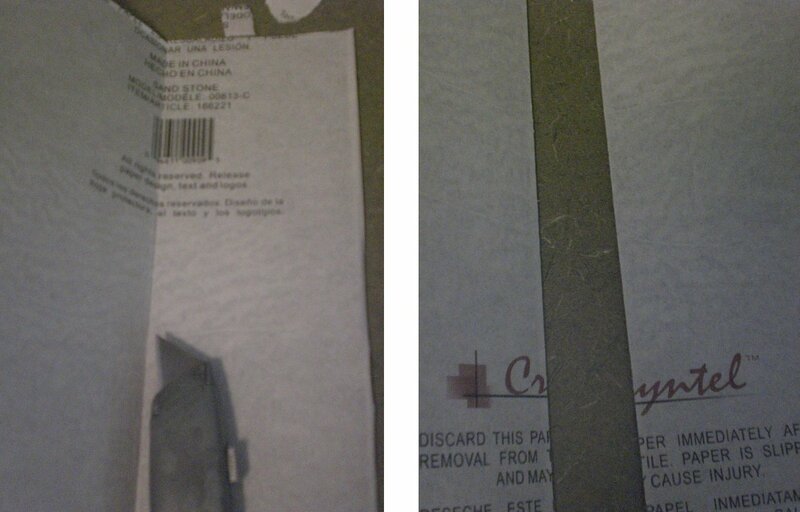 But after all my practice in the kitchen, I just sailed on through with my handy-dandy utility scissors. 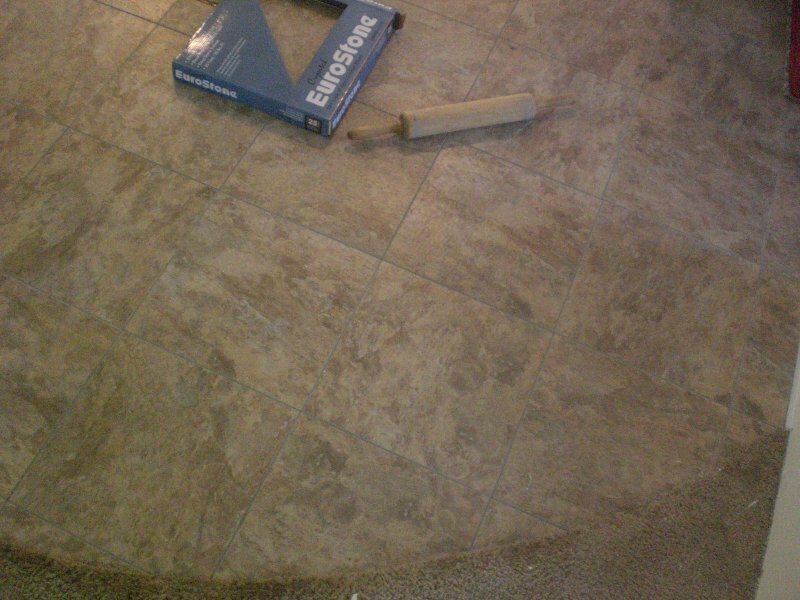 I sailed blithely into cutting the last tile anyway, doing my best to accommodate the little curve at the corner. That proved a bit more difficult than I’d initially thought. 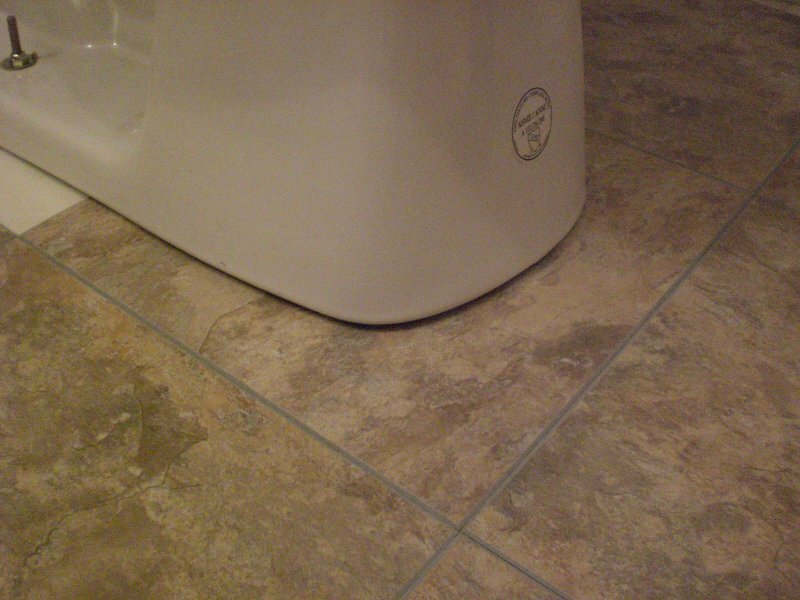 When I laid the tile down for a test, I saw that I’d cut too little away from the corner where the small ring sits and too much away from the curve to go around the toilet. Blah. 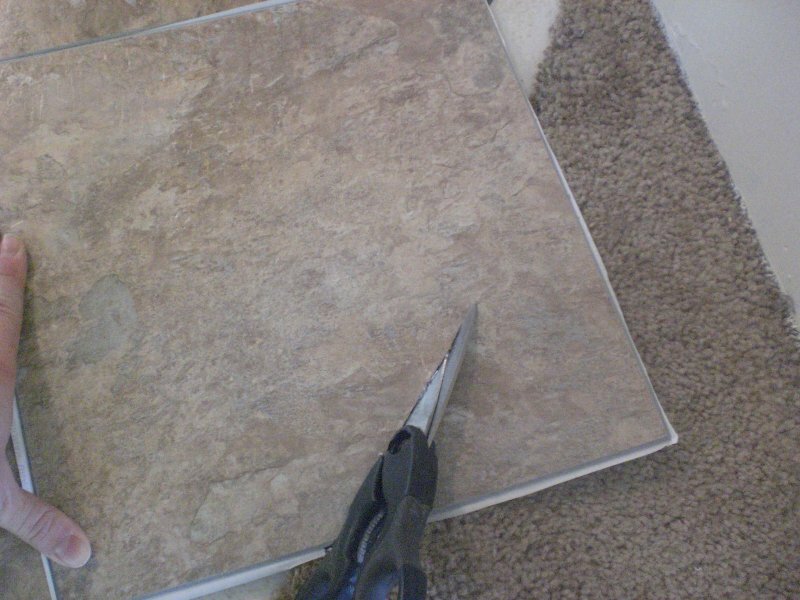 I didn’t want to waste an entire tile, so instead of cutting a new one, I just picked up the scrap that came from cutting out the larger curve and cut a piece from it to fill in the half-moon area of linoleum that still showed. 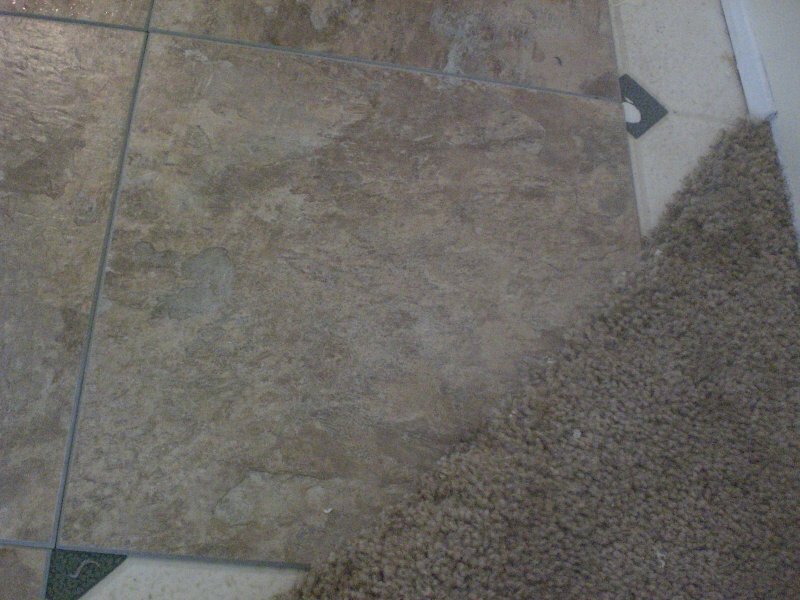 When I stepped back a couple of feet, I couldn’t even see the “patch,” and I was delighted to have the entire bathroom floor redone in under 45 minutes! The new floor is very nice to look at and much easier to keep clean. 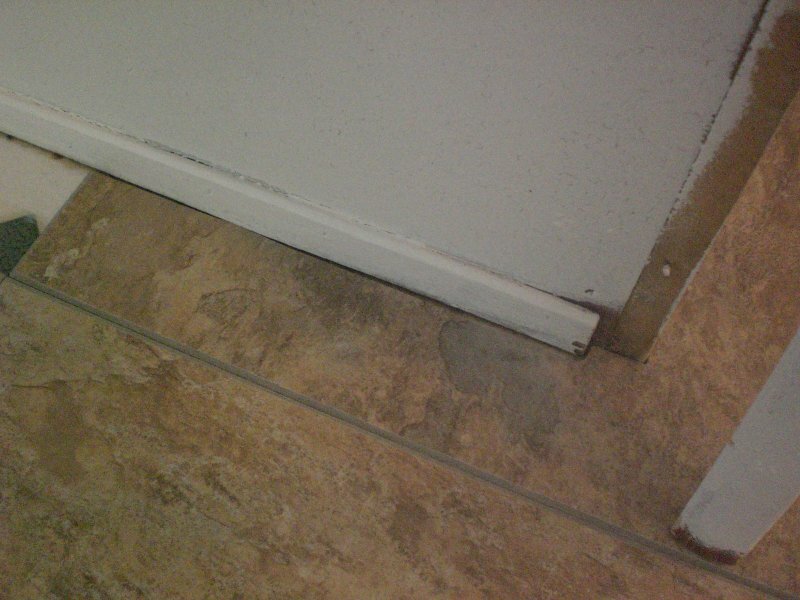 Total cost for this redo (at 44 cents per sticky tile)? $11! Can’t be beat. Well worth the elbow grease! 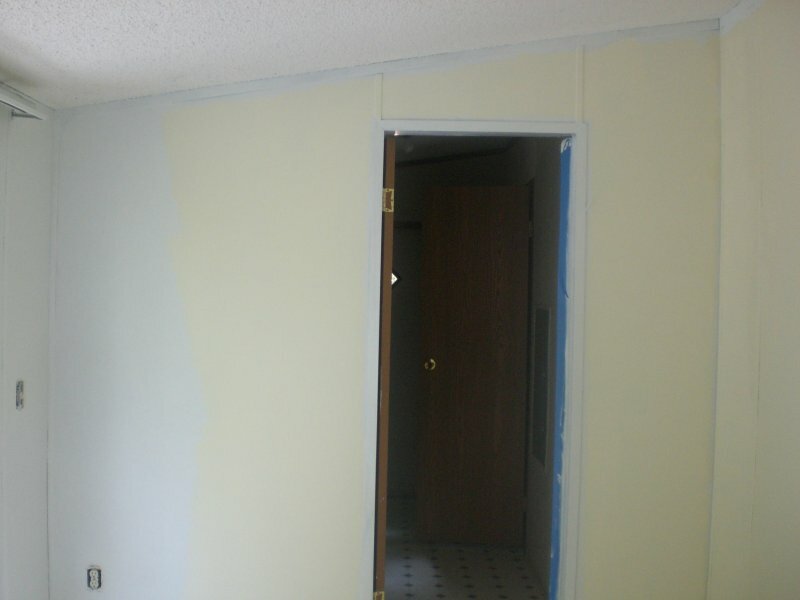 Next bathroom project: painting over the vinyl wallboard’s “wallpaper” to give the bathroom a more updated look. Hurrah! All finished and looking good! New floor in a snap! When I ran out of primer and had to stop back at Lowe’s for more, I was very excited to find the Cryntel vinyl tile I liked was 50% off! That meant each tile came in at 44 cents–just as good as the eBay prices but without the shipping! 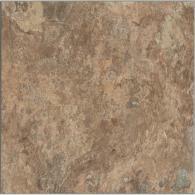 This is the “Sandstone” color, which is similar to ceramic tile I’ve loved in our old house. It’s the color of dirt, so dirt won’t show easily! 😉 I went ahead and purchased enough tile to cover the kitchen, sunroom, laundry room, and large laundry room closet. 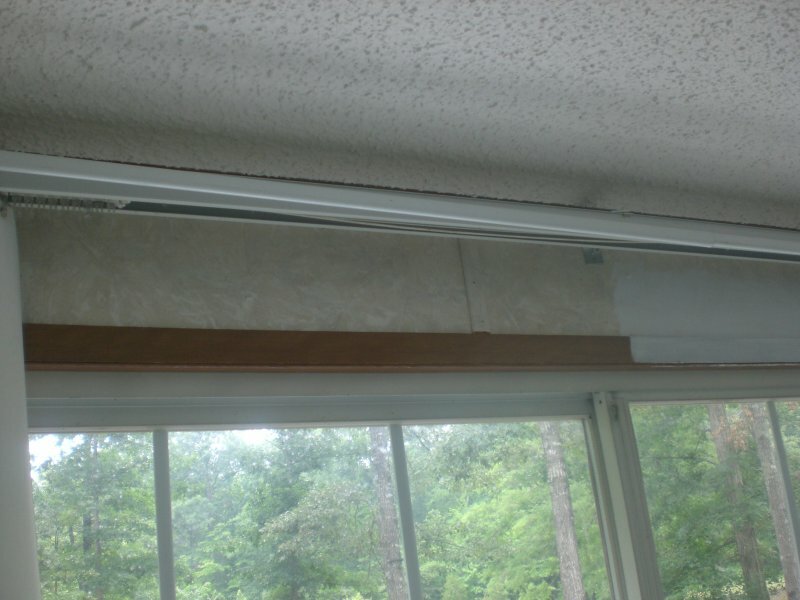 I needed just under 350 square feet to do everything. 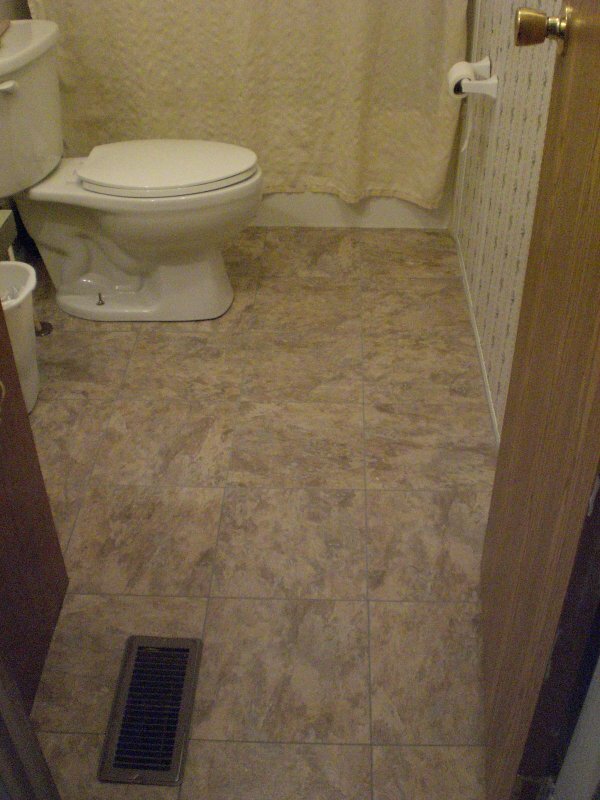 As always, you’re supposed to add 8% for waste, so I decided to purchase 375 square feet of the tile. Lowe’s had just that in stock with one box left over! 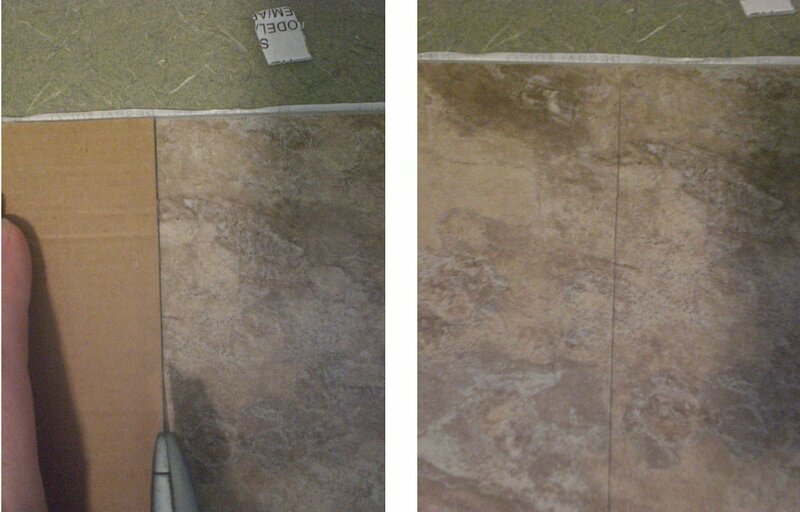 I was so glad I’d just “happened” to be in the store that day and had thought to check in the flooring section. 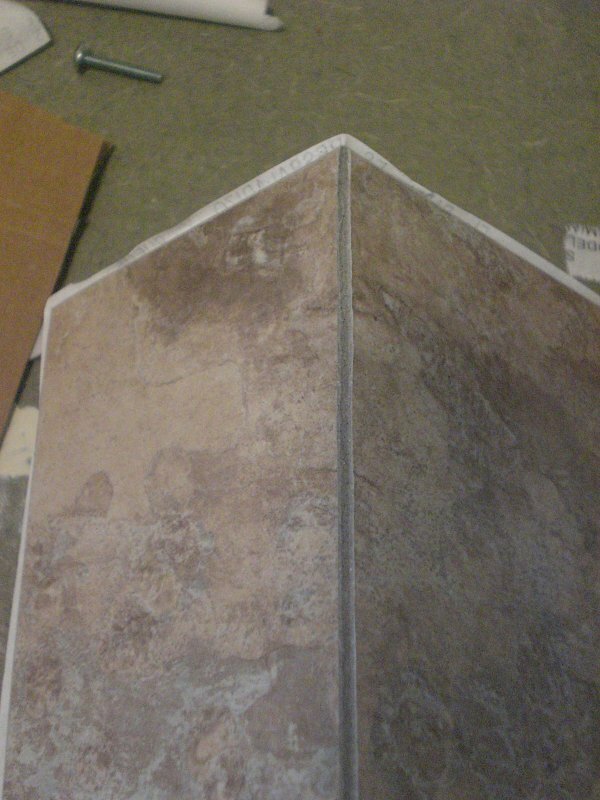 While there, I also grabbed some ceramic tile to test out on the laminate countertops for a future project. 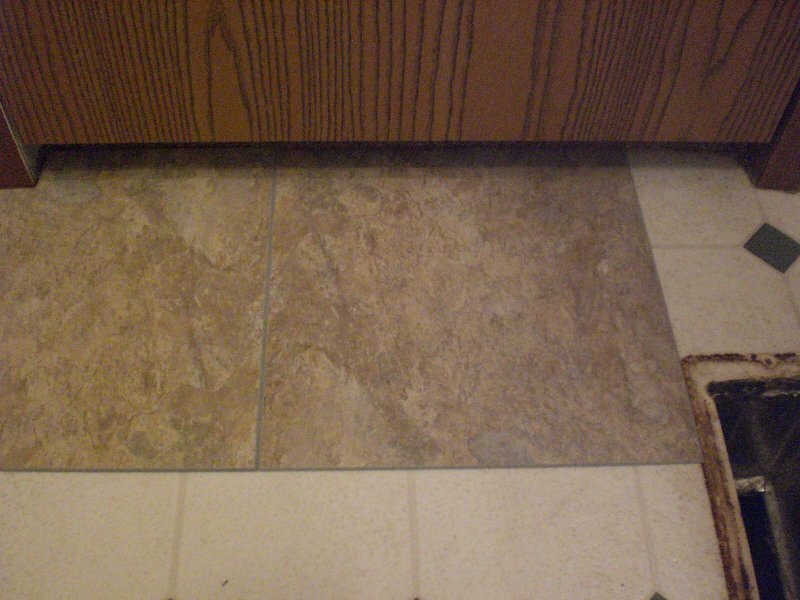 The flooring tile sat around for over a month and a half before I got to it, since life got busy and I had no time for the trailer during the last half of March and most of April. 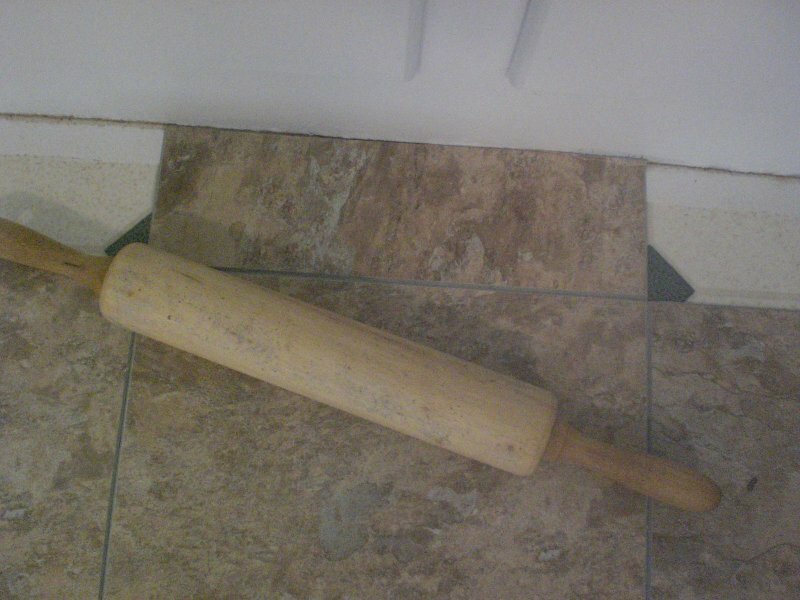 After finishing the kitchen cabinet re-do, I went ahead and de-waxed the linoleum floors as directed, using two parts ammonia to one part water. After letting this dry and air out thoroughly, I thought I’d just put down a couple of the peel-and-stick tiles to see how they looked. 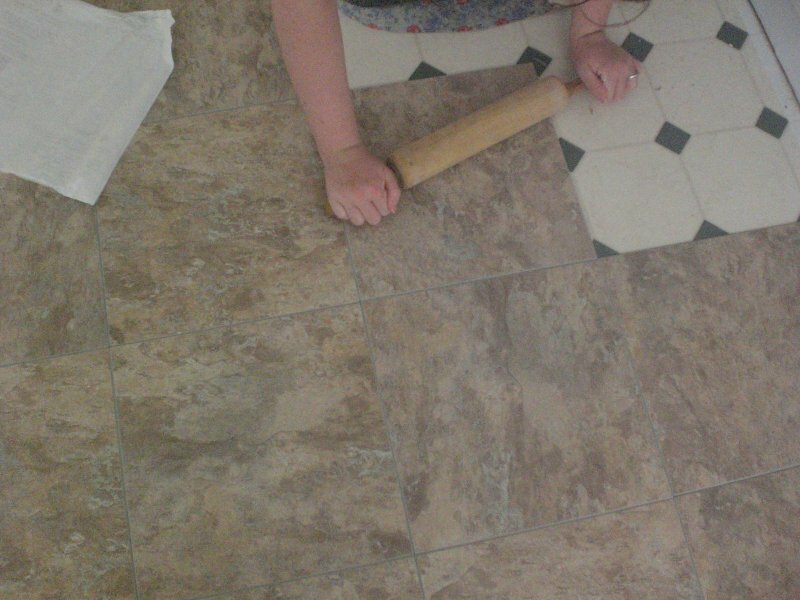 My helper from church and I measured to find the center of the kitchen. 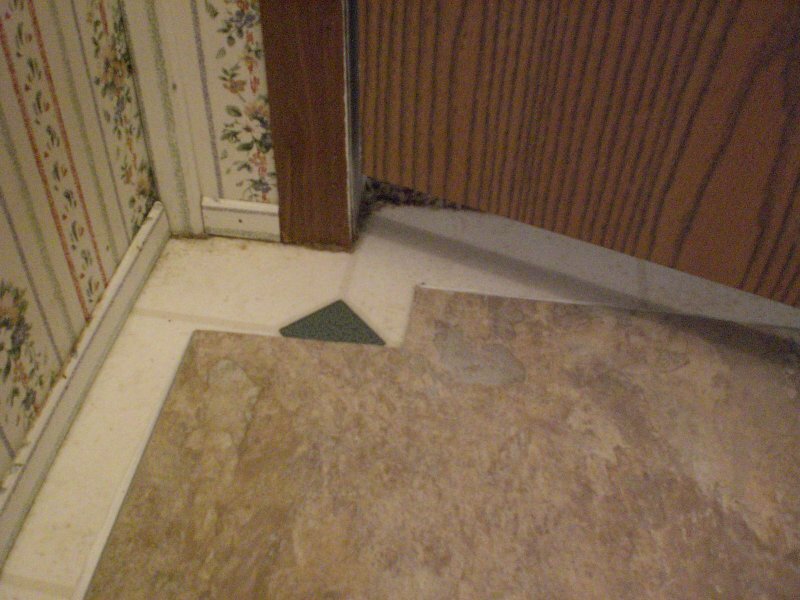 Normally, you’d mark the center by snapping a chalk line, but the white linoleum was already in a one-foot-square grid pattern, so we measured and found that the exact center of the room was only one and a half inches off in the grid. It would be a piece of cake to use the grid to lay the tiles perfectly square, so we opted to do that instead of starting at the exact center. 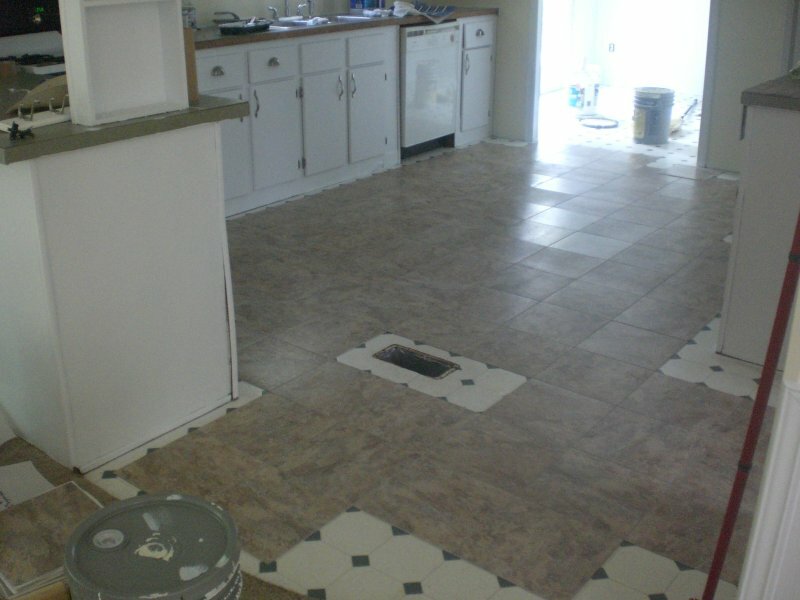 I’d thought we’d just put down a few tiles to “see how it’s going to look,” but, before we knew it, we’d tiled half the kitchen! This job is actually so easy that my children later got in on the act. 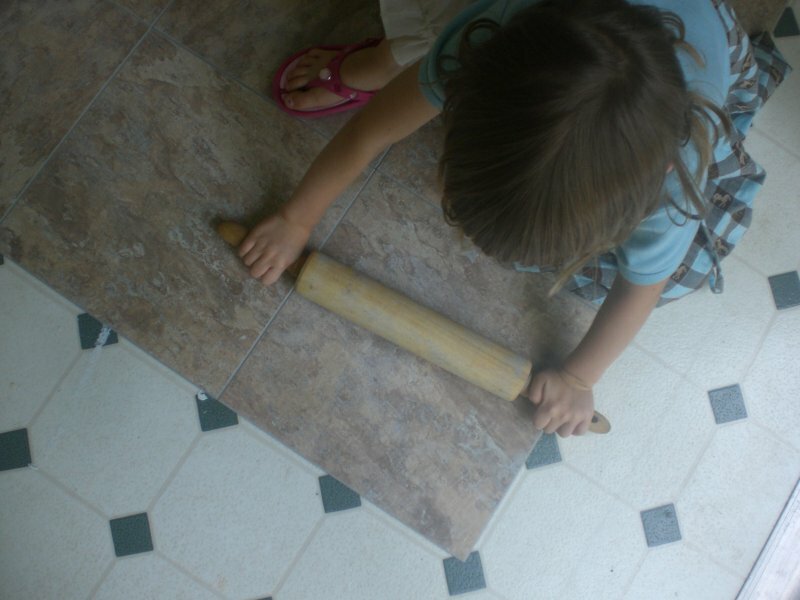 Here’s my daughter helping Mommy “rolling pin the floor” (as she said!). This was well worth the grand total of six hours (including breaks for lunch!) that it took to get our new floor down. We are absolutely tickled pink with the results. And the final cost, including the ammonia I purchased to clean the floor? $167.44. 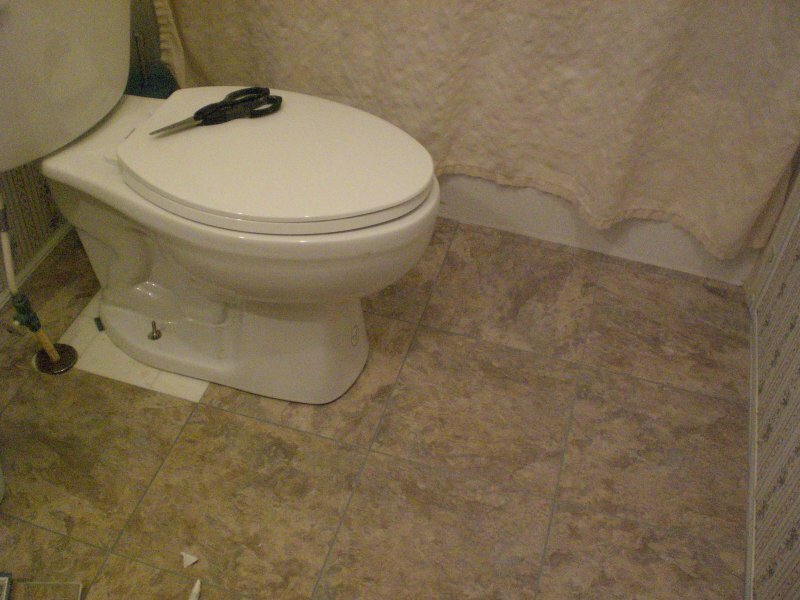 Another bargain basement do-it-yourself project! Next time I’ll show the results of the living room paint job and share some decorating photos that have inspired me. See you then!